You’ve just found out you’re pregnant. Congratulations are certainly in order for this momentous occasion. If this is your first time as a mother-to-be, you may have a lot of questions, like how is the pregnancy going to affect you? After all, as the baby grows inside you, your body will transform over the next nine months. We’ll explain more about what to expect as your pregnancy progresses, what may cause pain, and how seeing a chiropractor during pregnancy is a smart option. Your body is slowly yet surely accommodating a growing baby. While the biggest change you’ll notice is an increasingly larger stomach, internally, there’s a lot going on too that could cause pain. How Does Chiropractic Care During Pregnancy Near Thousand Oaks, CA Help with Pain? Pregnancy can be painful, but it doesn’t have to be! Moms-to-be should be as relaxed an excited about their impending baby as possible. If you have more than the typical aches and pains of pregnancy, come see how chiropractic care during pregnancy near Thousand Oaks, CA can help. One of the symptoms, so to speak, of pregnancy, is changes in spinal positioning. Your spinal ligaments may feel looser than usual, which is known as ligamental laxity. This can be very uncomfortable to deal with. Your chiropractor can realign your spine with chiropractic techniques such as adjustments, spinal decompressions, and manipulations. If your spine is upright and positioned correctly, a lot of your back pain will disappear. The pressure that is being placed on the spine now will be displaced elsewhere. That means the other bodily pain you have may abate as well. Of course, the further through your pregnancy you get, the more the bodily changes above will take effect. Therefore, it’s best you keep seeing your chiropractor throughout your pregnancy to ensure you’re in the best shape to deliver your baby. At Duben Holistic Chiropractic Center, your chiropractor during pregnancy, we promote emotion, nutrition, and structure for all our patients. We offer back pain therapy programs and pain management services. Not only are chiropractic techniques a part of that program, but so too is getting more sleep and eating better. Through a combination of those lifestyle changes and chiropractic care, many patients report less back pain. Our other services include the Morphogenic Field nutrition technique, the 21-Day Purification diet, laser therapy, and applied kinesiology. To learn more about our services contact us or schedule an appointment today, give us a call at 805-494-1339. 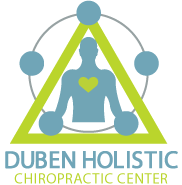 You can also visit us at Duben Holistic Chiropractic Center on 3625 East Thousand Oaks Boulevard, Suite 172.